August 21, 2017—Editor’s note: The AIRdaily is a constant buzz of conversation and insight. Whether it’s a midnight inquiry from a producer who wants to pitch an audio postcard about the eclipse or a midmorning callout for help with home studio upgrades, the forum is a place for AIRsters to convene, commiserate, and—especially—collaborate. Florida-based AIR producer and retired CEO-turned-podcaster Steve Leveen brought his pitch to the AIRdaily in early January 2017 with hopes of finding a producer to help bring sound to his idea. Independent audio-maker Fernando Hernández answered that call from the other side of the country, and the podcast America the Bilingual began its journey to becoming sound waves. Four months later, their first episode was published. Now six months into the collaboration, Leveen and Hernández share their experience in a Q&A with AIR. Read on to find out how they juggle the creative process, use their different skill sets to produce work, and navigate a cross-country collaboration. Do you have a project you’d like to share with the network? Use #AIRsters when you post about your work on social media to spread the goodness! We’re always on the lookout for AIRster projects and pieces to spotlight and celebrate. SL + FH: America the Bilingual is for people who think bilingualism is good for them, their family, and their country. It tells stories of how learning a second language, or a third, or a fourth, was the defining factor in a person’s life—for the better. We use personal stories set against a background of research findings to help win hearts and minds. Our vision is an America where it’s just normal that everyone speaks two or more languages. SL: When I started studying Spanish about 10 years ago, I was surprised by the comments I got from my fellow Americans. “Why bother? The whole world speaks English,” and “Why bother? Technology will make learning languages obsolete.” Those questions set me on an adventure of learning all I could about bilingualism. I retired from my CEO job to spend a fellowship year at Harvard, followed by a year at Stanford. I discovered that our present state of majority monolingualism is not normal but unusual, both historically and internationally. People are designed to be bilingual. How did you get to AIR? SL: Soon I realized I had agreed to far more than just hitting the record button while on a phone call. In some desperation, I reached out to my friend Maja Thomas, who actually does know a lot about audio. She told me to join AIR, so I took her advice! FH: In 2015 I entered KCRW’s Radio Race and won third place with a piece called “Ahorita.” It was my first-ever radio piece in English. One of the prizes was a one-year listing on the AIR Talent Directory. When that expired, I decided to become a member. SL: After joining, I immediately posted a request looking for an independent producer to bring this podcast idea to life. About five people answered the request and I spoke with all of them. Fernando Hernández stood out in his enthusiasm and his skill sets. It helped that he was from Mexico and fully bilingual. We worked out a deal to produce 26 fortnightly episodes over a year. FH: I’m a super fan of the AIRdaily, which I check out almost twice a day. I saw Steve’s callout for a podcast producer who could help him on a new show about bilingualism. I immediately replied to his post and linked him to a piece I made back in 2015 that whimsically unveils a Spanish expression and its approach to time. A week or two later we were already producing the first three episodes. The trust and enthusiasm for this project was built right from the get-go. Where were you in your career when you joined? SL: I was on to my second career, sometimes called an encore career. I was actually returning to my first employment out of college—as a journalist and a science writer with a Ph.D. in sociology. FH: I had already been doing radio and podcasts in Mexico for almost 10 years but felt like the market for these media was shrinking for radio and stale for podcasting. Being an AIRster has been great not only because that’s how I met Steve, leading to us developing America the Bilingual together, but also because it was through AIR that I met my friend Tony Gannon (Life of the Law, Subframe) and other wonderful people. The opportunities that have arisen thanks to this membership have been: A piece for Latino USA, an article with Current magazine, and a voice-over gig for the Gravy podcast. I also started working with AIRster Carol Xu at Work Stories Project, a podcast designed to help people reimagine their work. I couldn’t be more satisfied. How did you work through roles and rates? The funding at this point in the enterprise comes from me. How do you navigate coast-to-coast communication? SL: We began with a document we call the DNA of America the Bilingual. In that, we wrote down all our various audiences and some of their viewpoints and needs, so far as we could figure them. Then we wrote our Mission and Vision. This evolving document, shared among the team, forms our foundational thinking. In some ways, I mentor Fernando. But in more ways, he mentors me. He has over 10 years of radio experience and it shows. He coaches my voice and narration. I thought I knew something about storytelling, but Fernando has taught me so much more. FH: Steve lives in Delray Beach, Florida, and I live in the Bay Area in California. So there’s a three-hour time difference, which you may say is an obstacle. But it’s not really, since we’re both early risers—5 a.m. early rising. Which means that by the time I wake up, Steve has already worked on a script, sent it out to me and is waiting for my comments and edits. Our meetings happen over the phone with a Google document that we work on simultaneously. That’s pretty much it. Can we get a lightning speed recap of how an episode comes together? SL: The team keeps a running list of episode ideas that evolves daily. Fernando and I talk through episode ideas. I pitch to Fernando and together we hammer through the outline and then move on to writing the script, editing, cutting, and collaborating. I find and interview subjects. Fernando does all sound design and mixing. Episodes are produced in a week and are on a two-week schedule. We are trying to get ahead of the game but so far are down to the wire for each episode; we’re both perfectionists, so it’s a problem! Amazingly, we have not yet met in person. But we plan on it this year. What a fine reunion that will be since we have been such close collaborators. Where do your stories come from and what does a conversation about ideas look like? FH: One filter is to try our best not to feature the same language more than once. But rather than that, we aim to find outstanding Americans who have mastered a second language, or a third, or a fourth. We dig into what was at stake, and if the story is compelling enough from the pitch stage, we turn it into an episode. Another way for us to look for stories is by delving into the problems that are in a way invisible for most Americans. The “Ed De La Torre Doesn’t Speak Spanish” episode is a perfect example of that. What drove me to work with Steve was a piece of data that he laid down on me during our first briefing phone call: More than 25 percent of American Latinos don’t speak Spanish. That startled me. We also have a season planner document where we pour all of our ideas and topics, and we consult that document pretty often. It’s always an ongoing conversation. Can you give us a glimpse behind your logo? SL: The name came first. We reached out to followers on Medium, Facebook, and my own Well-Read Life blog from Levenger for name ideas. 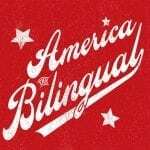 We settled on America the Bilingual to help reinforce the idea that bilingualism is a natural part of individuals and of America. For the logo, we wanted something Americana to lend visual strength to the idea and also stand out on mobile devices. The design process was managed by Carlos Plaza, who had worked with me at Levenger. We looked at vintage Americana posters and art, including baseball designs, and Carlos developed the design we love. It will now be applied to mic signs for location work, postcards, and even magnetic signs for my mobile recording studio—namely my Ford F-150 pickup. How did you prep for the official publication of the podcast? FH: We teamed up with our marketing partner, the Lead with Languages campaign by ACTFL. Our podcast is featured on the Success Stories section of leadwithlanguages.org. We are also included in the newsletter that is sent to thousands of ACTFL members, and we kept our social media follower base up to date on what we were preparing. What are your next steps and what are you doing to take them? What advice would you give to new podcaster-producer duos in the world to help them avoid easy pitfalls? FH: Establishing clear roles from the beginning is key. Steve is both the host/reporter and I’m the editor/producer. We never duplicate work: I don’t micromanage his interviews and scripts until he tells me he’s done. And at the same time, he’s not interested in snooping into the post-production process until the episode is ready. The mutual trust on each other’s potential has streamlined the process really quickly. Also, timing what each one is doing on his/her end is helpful, and it gives everyone a clearer idea on who’s doing what and how much time it requires. For this I use an app called “Toggl,” which allows you to time your projects and keeps track of your productivity.